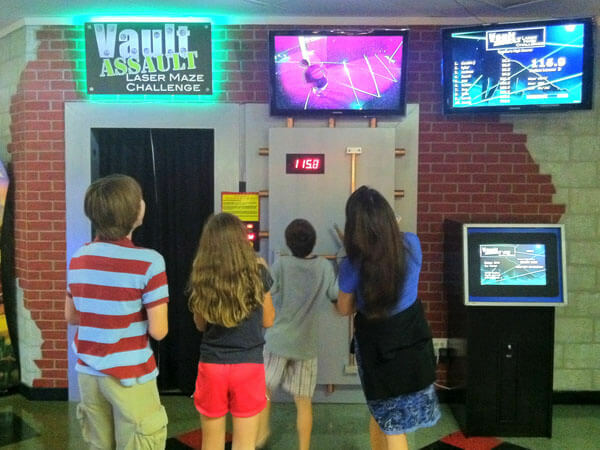 You’ll have to make it back to the door as quick as you can and AVOID breaking the lasers to get the lowest score possible. Just $3 per play! Compete against your friends for a spot on our top 10 score board! Check our Facebook page for tournament info! Vault Assault – Beam Buster is a new mode! While the goal in Laser Maze Challenge is NOT to break lasers, BEAM BUSTER loves breaking lazers! In fact, the goal of the Beam Buster mode is to break as many lasers as possible in the allotted time. When the maze is activated, ALL of the laser will be on. Once you enter the maze, the madness begins. Break all of the lasers in the room until they are all turned off, then, reactivate them by touching the lighted key or money. You can reactivate all of the lasers over and over to achieve the top Buster score! Just $3 per play! Check our facebook page for tournament info!